Of the four years we lived in Jacksonville, FL – from the summer of 1982 when I was nine through my 14th birthday, 09/12/1986 – the only year we did not return to Maine for Christmas vacation was 1985. That year I transferred my homesickness to a familiar stand-in, living my dreams of a white Maine Christmas through Frogtown Hollow, home of Emmet Otter. Christmas in Florida, even northern Florida, was depressing for a Maine boy. It was chilly – maybe in the 40s or at most 30s – but nothing like the pure Maine winter cold I wanted. There was certainly no snow. And my only lasting impression of Jacksonville Christmas cheer is an aluminum tree with the most garish lights imaginable on the roof of Jax Liquors. Bing Crosby had not visited my neck of the woods. But we did have HBO, and with that came salivation. Emmet Otter’s Jug Band Christmas had been a favorite since it premiered in 1977. The Jim Henson special, adapted from the 1971 Russell and Lillian Hoban book, came along at exactly the right time over Christmas 1985. 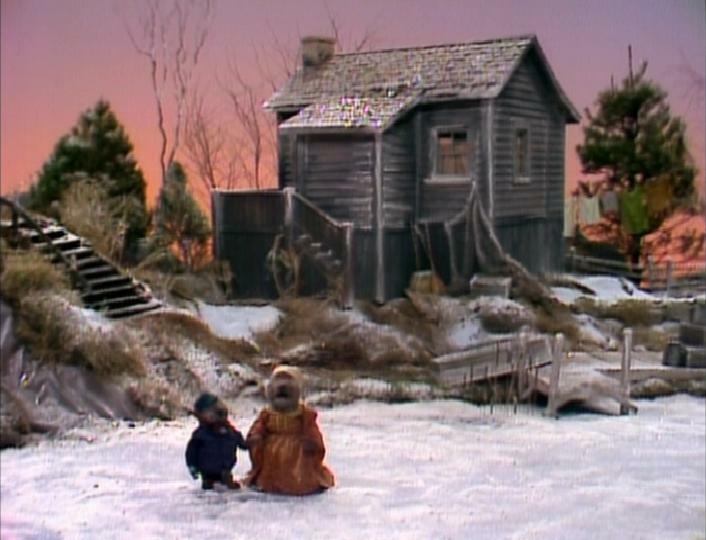 The Frogtown Hollow inhabited by Emmet and Ma Otter served as a virtual Maine Christmas at my grandparent’s farm as I sat in my Florida apartment. The fire-red sunset as Emmet and Ma row home from running errands made me dream of the sunsets I knew from the living room window at the farm. The sound of the snowmobiles driven by Chuck and the River Bottom Boys echoed the sound of snowmobiles heading up our path and into our woods. And the brilliant full moon that shone over Ma, Emmet and his jug band as they walked home in defeat from the Waterville Talent Contest was the same moon that shone over my brother Eric and I as we played football in the snow or went tobogganing by the barn light. You stunned me on the HBO. I don’t think I even knew about HBO until 1986. We actually had HBO before we left Maine, which is strange, because it cost extra! I remember watching Coal Miner’s Daughter and sneaking out to watch Scarface. Smart move for an eight-year-old. As a resident of this not-very-Christmasy state, if it were not for Frosty the Snowman I’d skip the holiday all together.. I still miss my northern Christmas. The things we remember from childhood…. I love that color sky. I was going to post something about Fleetwood Mac’s Bare Trees describing exactly that colored sky with snow flurries coming down. Yay! I didn’t know right off from the title that this was the song that I absolutely love. I must say though that I’m so used to hearing the second version, the commercial one, that I like it better. I had to youtube the Bare Trees version because of some rights issue or whatever. Thanks for the memories — who said that?! Glad to provide. *grin* Great stuff. Nice! It’ll be mixed in with all the other holiday classics. All of the other otter-related holiday classics, you mean. Glad to take you back and great to have you here, thanks!